A few weeks back a group of us discussed Leviticus 25 where God instructed the Israelites to take a Sabbatical year once every 7 years, then every 49 years to take a Jubilee year. We were all thinking how wonderful it would be to take one year off every seven years, then two years off every fifty. But the reality of our lives seems to prevent this. Or does it? One gentleman, who is our ‘numbers guy’ pointed out that instead of taking an entire weekend off like we do, if we worked six days a week for six years, we would then have worked an extra 365 days! While that’s a neat thought, I doubt my boss would go for it. But it did get me to thinking about how to honor that Sabbatical year, which brought me to thoughts of the weekly Sabbath. 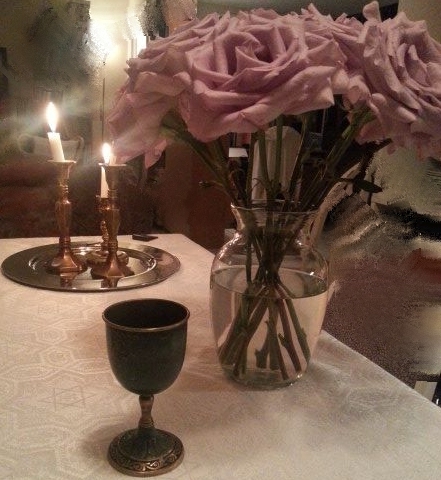 But as I started down the path with a simple decision to take baby steps (like lighting the Sabbath candles and closing the day out with Havdalah) it became easier and easier. And I learn a lot from the Sabbath. Today I’m going to share the most important lesson – at least it’s most important to me. Life is a gift. Out of all the gifts God pours down from heaven, the time on earth is His most precious gift. As with all gifts, we should be wise stewards of what we receive. Yeshua taught a parable that I use as a litmus test for myself, to see where I stand with Him in my walk. It is the parable of the sower (or the soil, depending on your perspective). Every now and then I check myself to see where I am with Him. Am I allowing the cares and concerns of this world to choke out the Word or am I rich soil, bearing a lot of fruit? In the same way the Sabbath provides me with a way to judge if I’ve been a wise steward of my time. When Friday evening arrives to find my work isn’t complete, my house isn’t clean, and the meal isn’t prepared, I clearly see that I have not been a wise steward of my time. On the other hand, when I reach Friday evening dressed and ready to welcome the gift of the Sabbath, I know I spent God’s gift of time wisely. You see, more than anything else the Sabbath teaches us to be prepared. Every week we have a clear picture of what this life is all about – being prepared to enter God’s eternal Sabbath. Every week we get to practice how to do that. Every week we have the Sabbath to check ourselves in that preparation. We get to rehearse six days of preparation and one day of rest. We get a small taste of what it will be like to gather with the family of God and bask in His presence without the cares and concerns of this world because they have all been addressed. So you see, the Sabbath teaches us to be focused on the task at hand, to be prepared, and to be wise stewards of our time – God’s most precious gift.